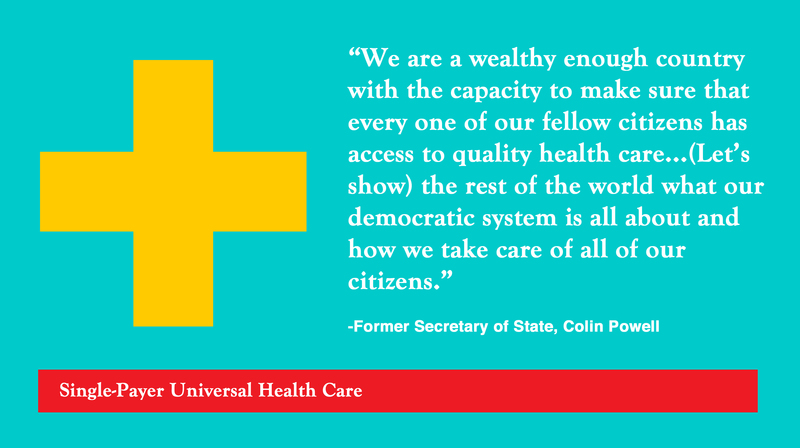 Colin Powell speaks out for single-payer. As the Obamacare enrollment deadline approaches (March 31st), we want to encourage the uninsured to explore their options at healthcare.gov. So far, 6 million Americans have successfully enrolled! Make sure you at least get your application going by March 31st and enjoy a bit of flexibility on completing your enrollment. Obamacare is a first step towards a just and affordable health care system, but certainly not the last. Awesome nonprofits around the country are currently hard at work, trying to win true universal health care in America through the single-payer system. That means no deductibles and no copays; high quality, affordable, and comprehensive health care, guaranteed to all citizens. Congratulations to our friends at Health Care 4 All PA for their recognition in “The Single-Payer Movement Expands” by Healthcare Finance News. In a groundbreaking study, they’ve demonstrated how single-payer would provide quality health care to all citizens and cost far less than our current model – a model which still denies millions of Americans access to health care. It takes the work of many around the country to bring about change, so consider volunteering with a single-payer nonprofit near you!